Wilson Daily Times, 22 August 1947. In addition to his business and real estate interests, William Hines for decades served as secretary-treasurer and general administrator of Mercy Hospital. This photograph, which probably dates from the mid-1950s, depicts Hines flanked by Helen James, nursing director, and Anna Burgess Johnson, hospital board member. Photo courtesy of O.N. Freeman Round House and Museum. Wiley Ricks is still barbering. 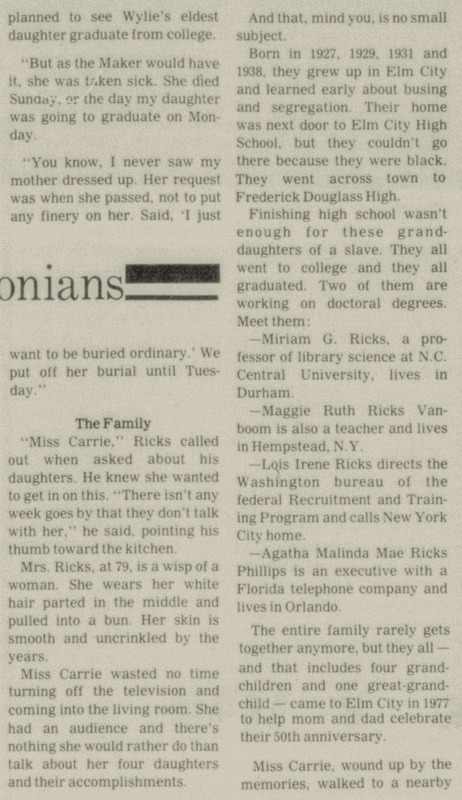 Wilson Daily Times, 13 October 1980. Wiley Ricks and young customer. In the 1900 census of Toisnot township, Wilson County: Millie Ricks, 40, widow, with sons William, 12, and Wiley, 1. On 27 July 1918, Wiley Ricks, 21, of Toisnot, married Fannie Fort, 21, of Toisnot, in Elm City. Presbyterian minister A.E. Sephas performed the ceremony in the presence of John Gaston, Samuel T. Ford and T.H. Nicholson. Fannie Ford Ricks died 9 March 1924 in Elm City, Toisnot township. Per her death certificate, she was born 11 January 1899 in Wilson County to Sam Ford of Halifax County and Mattie Williams of Wilson County and was married to Wiley Ricks. In the 1930 census of Toisnot township, Wilson County: Wiley Ricks, 30, barber; wife Carrie, 29; and children Miriam, 2, and Maggie, 9 months. In the 1940 census of Toisnot township, Wilson County: on Branch Street, barber Wiley Ricks, 41; wife Cary P., 39; and children Miriam, 12, Maggie R., 10, Lois, 8, and Malinda, 1. 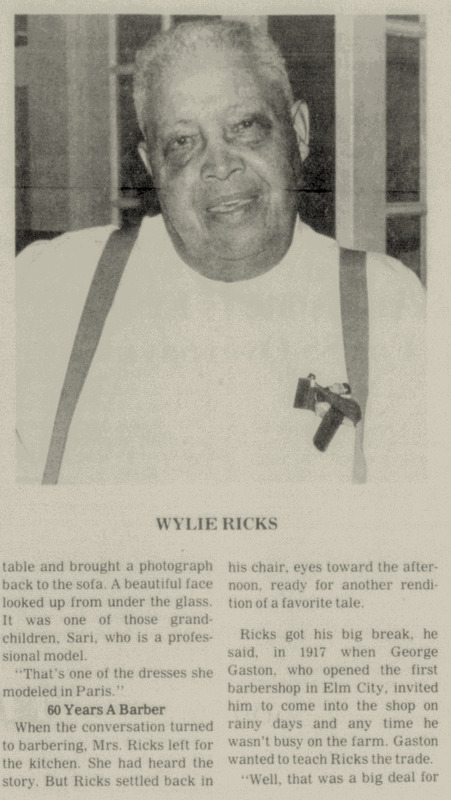 Wylie Ricks died 28 March 1985 in Hollister, Halifax County, North Carolina. Per his death certificate, he was born 4 December 1898 in Wilson County to Wiley Sharpe and Millie Sharpe; was a barber; resided in Elm City; and was married to Carrie Parker Ricks. A 1947 photo taken outside Wiley Ricks’ barbershop. Courtesy of Thomas Griffin via Wilson Daily Times, 15 January 2002. 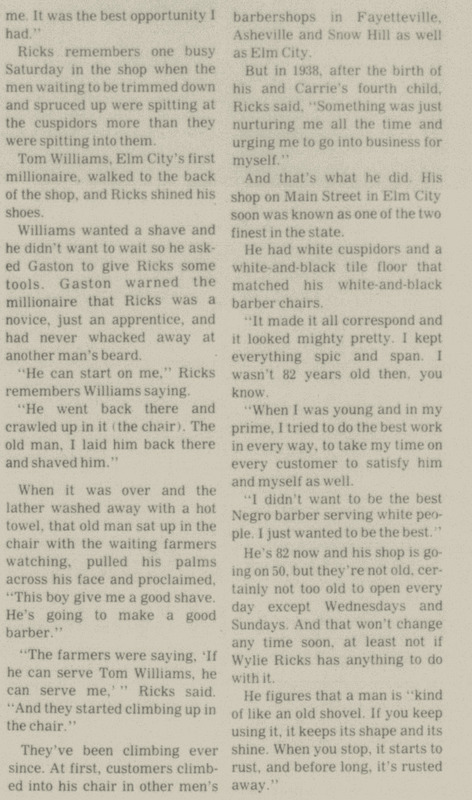 Haircut photo courtesy of article re Ricks in History of Wilson County, North Carolina (1985). Roscoe Harvey gets along with everybody. Wilson Daily Times, 8 August 1994. Roscoe Lee Harvey — in the 1910 census of Lumberton, Roberson County: Lonnie L. Harvey, 31, wife Rosa L., 24, and son Rosco, 5. In the 1920 census of Lumberton, Roberson County: Rosa Harvey, 32, cook, and son Roscoe, 14. On 27 June 1930, Roscoe Lee Harvey, 24, son of Lony Harvey of Wilson and Rosa L. Clark of Florida, married Helen McMillan, 20, daughter of Morris and Victoria McMillan, in Wilson. Rev. G.J. Branch of the United Holy Church of America performed the ceremony in the presence of Anderson Holden, Levi Godwin and Haywood Townsend. In 1940, Roscoe Lee Harvey registered for the World War II draft in Wilson. Per his registration card, he resided at 724 East Green, Wilson; was born 5 July 1905 in Lumberton, N.C.; his contact was wife Helen McMillan Harvey; and was self-employed at 114 East Barnes. On 7 July 1947, Roscoe Lee Harvey, 42, son of Lonnie Lovelace Harvey and Rosa Lee Harvey, married Rowena Stephenson, 26, daughter of Deans and Hattie Stephenson, in Wilson. Roscoe Lee Harvey Sr. died 17 August 2003 in Charlotte, North Carolina. Cherry Apartments — in the mid-1980s, Wilson Housing Authority renovated the former Hotel Cherry to create 108 apartments for senior citizens. 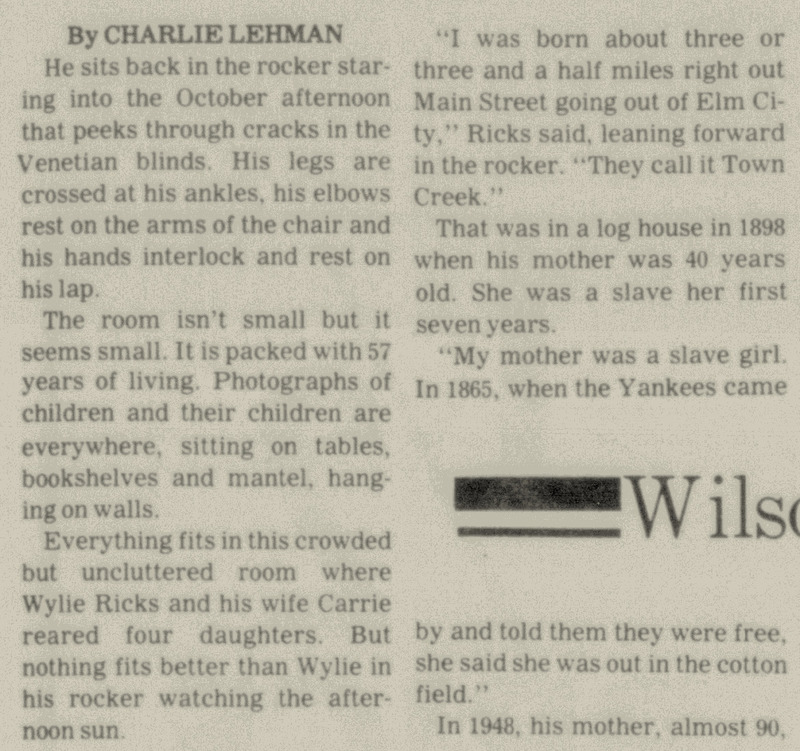 See Wilson Daily Times, 20 October 1994, page 3. Fred Artis — “Fred Artis Jr., son of the late Fred and Mattie Artis, was born March 17, 1916. He and his sister, Christine Currie, who preceded him in death, lived all of their lives in Wilson, NC. Fred departed this life on Monday, September 18, 2000.” Wilson Daily Times, 21 September 2000. Louis Perrington — Louis Alexander Manuel Perrington. “March 14, 1914 Dec. 5, 2001 Louis Alexander Perrington, 87, of 702 Elvie St., died Wednesday at his residence. The funeral will be conducted by the Rev. William L. Neill at 2 p.m. on Sunday at St. John AME Zion Church, 119 N. Pender St. Burial will follow at Rest Haven Cemetery. 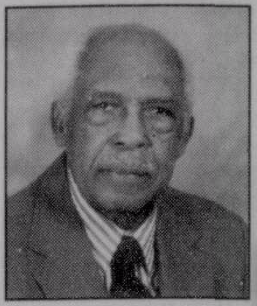 Perrington was a member of St. John AME Zion Church and Mount Hebron Masonic Lodge No. 42. He was retired from the Cherry Hotel. He is survived by his wife, Pearlean Barnes Perrington; one daughter, Jean Perrington-Ballard of Raleigh; one sister, Wilhelmenia Smith of Portsmouth, Va.; two grandchildren; and one great-grandchild.” Wilson Daily Times, 8 December 2001. Your father probably taught you to do this. Wilson Daily Times, 5 September 1924. We are what you should be. In early 1928, a group of young African-American men — friends and neighbors and almost all barbers or porters at barber shops — founded a social club in East Wilson. Baltimore Afro-American, 11 February 1928. Woodie Farmer — William Woody Farmer. In the 1928 Hill’s Wilson, N.C., city directory: Farmer Woody (c) porter Wm Hines h 706 E Green. On 13 January 1929, Woody Farmer, 22, son of John Wash Farmer and Edmonia [no maiden name], married Savannah Powell, 21, daughter of Wiley Powell, in Wilson. Presbyterian minister A.H. George performed the ceremony in the presence of Emma Farmer, Rufus E. Speight and Theodore Speight. In the 1930 census of Wilson, Wilson County: at 706 East Green, plasterer John A. Farmer, 60; wife Nona, 61; sons James E., 17, and Woodie, 22, barber; and daughter-in-law Savana, 22, lodge bookkeeper. Freeman Ennis — in the 1928 Hill’s Wilson, N.C., city directory: Ennis Freeman (c) barber W S Hines h 904 Viola. In the 1930 census of Wilson, Wilson County: at 904 Viola, rented for $15/month, Maggie Ennis, 45, and children Freeman, 22, barbershop bootblack, Earl, 12, and Hennie, 10, and roomer Julus Barnes, 27, laborer at Hackney body plant. 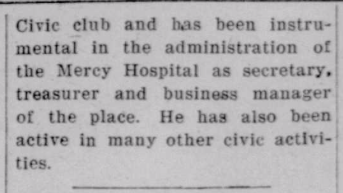 Freeman Ennis died 5 January 1938 at Mercy Hospital. Per his death certificate, he was 29 years old; single; worked as a bell boy; and was born in Wilson to Samuel Ennis of Smithfield and Maggie Taylor of Wilson. Informant was Earl Ennis, 904 Viola. George E. Brodie — in the 1928 Hill’s Wilson, N.C., city directory: Brodie Geo (c) student h 903 E Green. In the 1940 census of Wilson, Wilson County: at 311 Pender, Lawrence Hardy, 39, pantry(?) servant at college; brother James Hardy, 39, presser at cleaning works; and George Brodie, 33, barber. Rufus Speight — in the 1928 Hill’s Wilson, N.C., city directory: Speight Rufus (c) porter Wm Hines h 624 Viola. In 1940, Rufus Edward Speight registered for the World War II draft. Per his registration card, he lived at 624 East Viola; was born 4 October 1907 in Whitaker, North Carolina; his contact was brother Theodore Speight; and he worked for Bill Hines at 130 South Goldsboro Street. Jerval Barnes — probably, Jerrell Randolph Barnes, who died 14 December 1929 in Wilson. Per his death certificate, he was born 7 May 1909; was single; worked as a common laborer; and was born to Ned Barnes and Louisa Gay. Informant was Alice Bryant, Wilson. In March 1906, Noah J. Tate, Walter S. Hines and Joshua L. Tabron executed a lease-purchase agreement with Richard Renfrow for the entire contents of a barber shop, including four “hydrantic” chairs, four mirrored cabinets, a barber pole and eight water bottles. These items were “packed in R.E. Hagan’s Shop on Barnes Street,” which Tate, Hines and Tabron had purchased. Renfrow agreed to pay three dollars a week, plus insurance and taxes on the property. After 132 payments, Renfrow would own the barber shop. He paid at an accelerated rate, and the debt was cancelled before the end of the year. Wilson Mirror, 6 May 1891. Whether in fact this was Lemon Taborn‘s favorite song, this brief piece preserves a bit of personal information about one of Wilson’s earliest barbers — his love of fishing. Snaps, no. 34: Charles William Hagans. Charles William Hagans (1883-1949), son of Lawrence and Mary Etta Pender Hagans. In the 1900 census of Gardners township, Wilson County: farmer Larnce Haggan, 49, wife Etha, 44, and children Joe, 21, Augustus, 19, Oscar, 18, Charlie, 16, Annie, 13, Connie, 10, Lena, 8, Mollie, 7, William L., 4, Minnie, 3, and Pattie, 1, and Lawrence’s widowed mother Alice Hagans, 70. In the 1920 census of Beaver Falls, Beaver County, Pennsylvania: at 1315 Seventh Avenue, Charles Hagen, 35, self-employed barber; wife Gertrude, 36; lodger London Broady, 32, barber; and nephew Raymond Hartzell, 30, garage mechanic. Charles was born in North Carolina; Gertrude and Raymond in Ohio; and London in Virginia. Report to the 1920 census notwithstanding, C. William Hagans and Amanda G. Nichols were not married until 25 January 1921, when they wed in Summit County. Ohio. 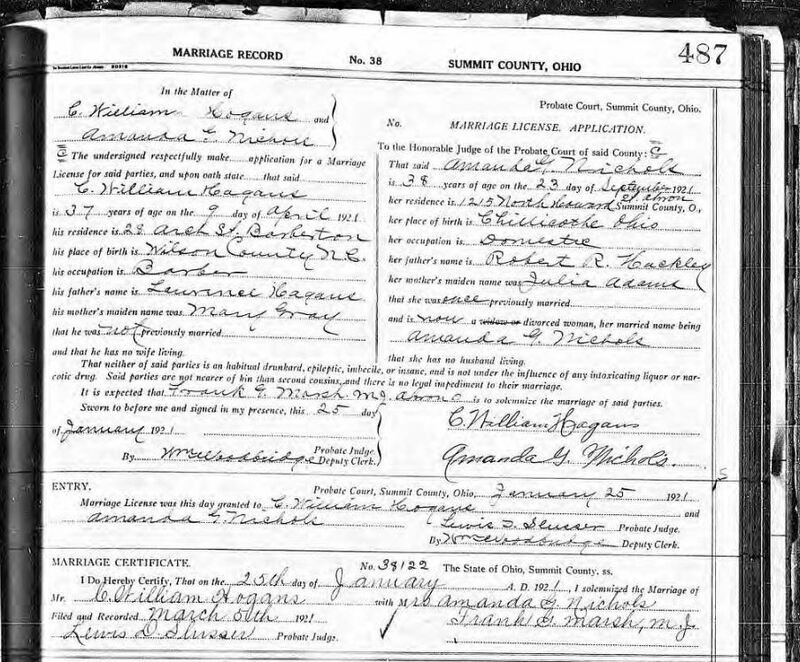 Per their marriage license, Hagans was born 9 April 1884 in Wilson County, N.C., to Lawrence Hagans and Mary Gray; worked as a barber; and lived at 28 Arch Street, Barberton, Ohio. Amanda G. Nichols was born 23 November 1883 in Chillicothe, Ohio, to Robert R. Hackley and Julia Adams, and had been married once before. On 1 July 1927, Charles W. Hagans was sentenced to serve one year in the Allegheny County Workhouse on a conviction for unspecified liquor law violations. A register shows that he reported 7 July 1927; was 43 years old; was born in North Carolina; was of medium complexion with black hair and brown eyes; was 5’8″, weighed 160 pounds at entry at 174 at release; was a barber (and worked as same while incarcerated); and was a Methodist. He was released early — on 30 April 1928. In the 1930 census of Battle Creek, Calhoun County, Michigan: at 148 Roseneath, rented for $35/month, barber Charles W. Hagans, 45, born in North Carolina; wife Gertrude M., 46, born in Ohio; and lodgers John Young, 30, drugstore porter, born in Pennsylvania; and Harry Godbolt, 46, barber, born in South Carolina. In the 1940 census of Battle Creek, Calhoun County, Michigan: at 101 Glenurban Avenue, barber Charles W. Hagans, 56, born in North Carolina; wife Gertrude, 56, born in Ohio; and lodgers Taswell Buckner, 50, insect and rodent exterminator, born in Alabama, and Harry Godbolt, 55, laborer on city streets, born in South Carolina. In 1942, Charles William Hagans registered for the World War II draft in Calhoun County, Michigan. Per his registration card, he was born 9 April 1884 in Wilson County, North Carolina; resided at 36 North Wood, Battle Creek, Calhoun County; and his contact and employer was George Anderson, 56 1/2 Capital S.W., Battle Creek. Charles W. Hagans died 11 November 1943 in Battle Creek, Calhoun County, Michigan. Per his death certificate, he was born 9 April 1884 in Wilson, North Carolina, to Lawrence W. Hagans. Gertrude Marie Hagans died 5 October 1948 in Battle Creek. Per her death certificate, she was born 1891 in Chillicithe, Ohio, to James Hockley. Charles and Gertrude Hagans are buried in Rest Haven cemetery, Wilson. Photos courtesy of Ancestry.com user TeiaHarper1; U.S. School Yearbooks, 1900-1990, database on-line at Ancestry.com; Allegheny County Workhouse, Pennsylvania Prison, Reformatory and Workhouse Records, 1829-1971, database on-line at Ancestry.com. Studio shots, no. 53: Willie G. Reid Sr.
Willie G. Reid, circa 1920, with what appears to be the one-armed chair. Willie G. Reid (1903-1963), son of William and Elizabeth Wilson Reid, was one of several members of a large Wayne County who made their way to Wilson. Brothers J.D. and Elijah Reid were his father’s first cousins, and Allen T. Reid, his nephew. In the 1910 census of Nahunta township, Wayne County: farmer William Reid, 59; wife Bettie, 54; and children Hattie, 23, Milton, 19, Iantha, 16, Council, 15, Vestus, 13, Loumisa, 11, Ghorom, 8, and Madie, 5. In the 1920 census of Stantonsburg township, Wilson County: tenant farmer William Reid, 63; wife Bettie, 52; and children Iantha M., 25, Council, 23, Vester, 21, and his wife Hattie, 19, Gorum, 17, Mater, 14, [granddaughter?] Marain, 7, and [grandson?] Melab, 15 months. On 30 October 1933, Gorham Reid, 30, of Greene County, son of Bill and Bettie Reid, married Ada Harriss, 25, of Wilson, daughter of Leander and Rosa Harriss. Primitive Baptist elder Paul Bunch performed the ceremony at L.H. Harriss’ in Black Creek in the presence of David Bynum, G.S. Woodard, and S.L. Woodard. Willie Gorham Reid registered for the World War II draft in Wilson County in 1942. Per his registration card, he resided at 1013 East Nash Street; was born 12 August 1903 in Wayne County; his contact person was Mary Artist, 1013 East Nash; and he was self-employed barber working on Main Street, Black Creek. Willie Ghorum Reid died 28 February 1963 at Mercy Hospital in Wilson. Per his death certificate, he was born 12 August 1902 in Wayne County to William Reid and Bettie Wilson; was married to Ada Reid; resided at 1013 East Nash; and was a barber at William Hines Barber Shop. Photograph courtesy of Adventures in Faith: The Church at Prayer, Study and Service, the 100th anniversary commemorative booklet of Calvary Presbyterian Church.